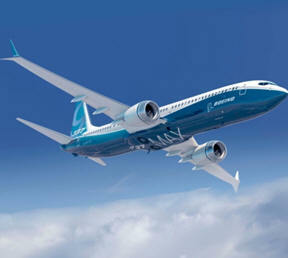 May 3, 2012 - Boeing announced a new winglet design concept for the 737 MAX. The new Advanced Technology winglet will provide MAX customers with up to an additional 1.5 percent fuel-burn improvement, depending on range, on top of the 10-12 percent improvement already offered on the new-engine variant. "The Advanced Technology winglet demonstrates Boeing's continued drive to improve fuel burn and the corresponding value to the customer. With this technology and others being built into the MAX, we will extend our leadership," said Jim Albaugh, president and CEO, Boeing Commercial Airplanes. "Incorporating this advanced technology into the 737 MAX design will give our customers even more advantage in today's volatile fuel price environment." Compared to today's wingtip technology, which provides up to a 4 percent fuel-burn advantage at long ranges, the Advanced Technology winglet provides a total fuel-burn improvement of up to 5.5 percent on the same long routes. "The concept is more efficient than any other wingtip device in the single-aisle market because the effective wing span increase is uniquely balanced between the upper and lower parts of the winglet," said Michael Teal, chief project engineer, 737 MAX. Boeing aerodynamicists used advanced computational fluid dynamics to combine rake tip technology with a dual feather winglet concept into one advanced treatment for the wings of the 737 MAX. The Advanced Technology winglet fits within today's airport gate constraints while providing more effective span thereby reducing drag. Ongoing 737 MAX testing in the wind tunnel validated the new concept on the airplane. The super-efficient design has been incorporated into the 737 MAX design and production system plans. "We have assessed the risk and understand how to leverage this new technology on the MAX within our current schedule," said Teal. "This puts us on track to deliver substantial additional fuel savings to our customers in 2017." Airlines operating the 737 MAX now will gain an 18 percent fuel-burn per-seat improvement over today's A320. Depending on the range of the mission, MAX operators will realize even more savings. "Adding the Advanced Technology winglet to the 737 MAX is consistent with our demonstrated performance on delivering increasing value to our customers, on time, throughout the life of the 737 program," said Beverly Wyse, vice president and general manger, 737 program.